You can check out their calender and buy your ticket in this link. Zorlu Performans Sanatları Merkezi is one of the biggest and most equipped performance arts center with its Main Theater designed on a 55.000 m2 area and having a capacity of 2.190 people, its Drama Stage having a capacity of 678 people, 280 people capacity Studio with latest technological advances, its Sky Lounge being preferred for any exhibitions and corporate events, its VIP Lounge providing an area for special invitations and foyer areas expanded to three floors and 2.500 square meters in total. Beyond from contributing to the art and entertainment life of the society, Zorlu PSM became a platform directing the art life of Turkey in a short time not only solved the place problem for global art events which was a need of İstanbul; but also contributes to the city to turn into a national and international attraction center. Both with the richness of the programs offered and transportation easiness Zorlu PSM makes art close to its guests, becomes a socializing area living constantly by having an important place in the lives of the city inhabitants. Aiming to meet different zones of the society with different culture and art events initially in İstanbul and to be one of the elegant and well-known performance arts centers not only of Europe but also of the world, Zorlu PSM waits excitedly to host its guests in the coming term with the innovations that are going to be done. Zorlu Performans Sanatları Merkezi creates serious experience, international communication network and management philosophy as well as in technical issues apart from the artistic ones and presents this to all its partners. As a requirement of art’s globosity, Zorlu PSM opens its doors to works addressing to different zones of the society since the time it was opened and is still hosting the worldwide well-known Broadway and West End musicals, stars admired by millions and experimental theater groups. While doing differentiation works for hosting worldwide well-known musicals and admired productions in their stages and using the places more active, it is going on supporting various projects touching İstanbul’s culture and art life with social responsibility awareness. For example, it undertakes the hosting of events such as Barış İçin Müzik Vakfı 10th Year Concert, the commemoration concert organized by TEV for Zeki Müren’s 20th death anniversary etc. Zorlu PSM also brings worldwide well-known artists together with their fans according to its alternative rock, electronic pop, progressive rock and post rock mixed line-up. 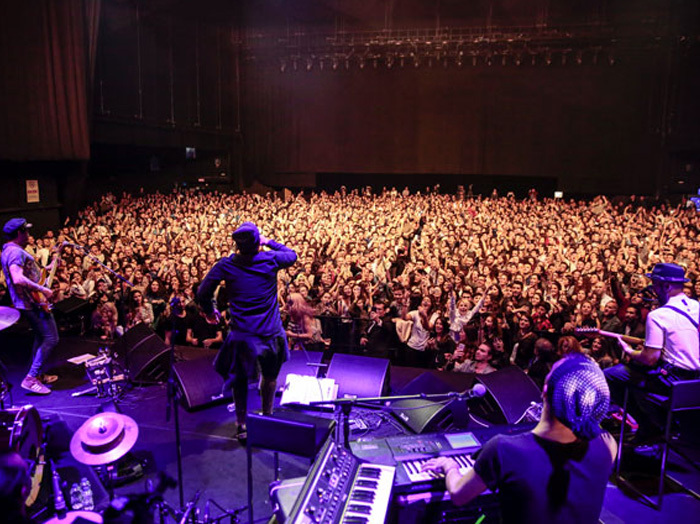 Especially in the spring and summer seasons in which the city’s energy is extra high, different audience groups meet with different genres in different stages of the venue. The suitable atmosphere for the artist and music is created in Zorlu PSM with its changeable stage which can be used in various forms such as standing, sitting and both sitting and standing.